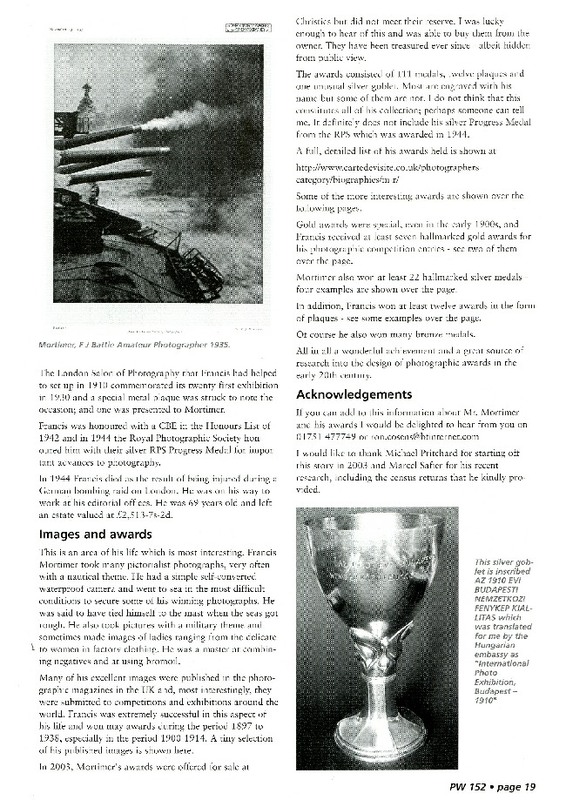 This biography is in a different format to most of our other biographies as it concentrates on the awards and achievements of a photographer who did NOT run a studio. He was a very successful photographic competition winner as well as being a lifelong editor and author of photographic literature. 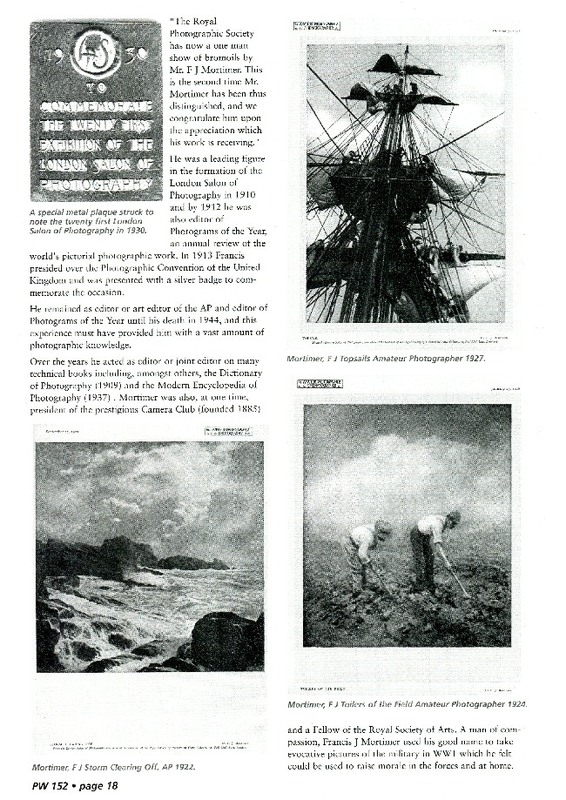 He was, most notably, editor of the Amateur Photographer magazine for many years. The second part of this article consists of a list of awards won by him both in the UK and in other parts of the world. Click to view the List of Awards. 1897 No. 60a – Two medals and case: brown metal; each approximately 3.5cm x 2cm; one inscribed S.A.P.S., F.J. Mortimer, Hand Camera Wk, 1897; the other S.A.P.S., F.J. Mortimer, Lantern Slides, 1897. 1897 No. 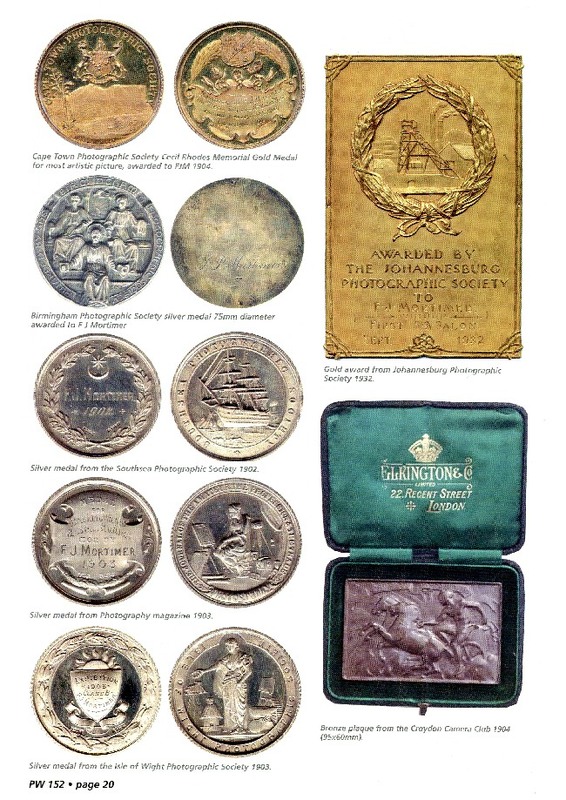 60b – Two medals and case: brown metal; each approximately 3.5cm x 2cm; one inscribed S.A.P.S., F.J. Mortimer, Hand Camera Wk, 1897; the other S.A.P.S., F.J. Mortimer, Lantern Slides, 1897. 1901 No. 61 – Medal and case: brown metal; approximately 4cm in diameter; medal inscribed Class: Portraits, Awarded to F.J. Mortimer, 1901; case inscribed Southsea Amateur Photographic Society. 1901 No. 62 – Medal and case: brown metal; approximately 4cm in diameter; medal inscribed Class: Figure Studies, Awarded to F.J. Mortimer, 1901; case inscribed Southsea Amateur Photographic Society. 1901 No. 63 – Medal: brown metal; approximately 3.5cm x 3cm; front inscribed F.J. Mortimer; back inscribed 1901, Sunderland Camera Club. 1902 No. 64 – Medal and case: silver (hallmarked); approximately 4cm in diameter; front inscribed Southsea Photographic Society; back inscribed F.J. Mortimer, 1902. 1902 No. 65 – Medal and case: silver (hallmarked); approximately 4cm in diameter; front inscribed Southsea Photographic Society; back inscribed F.J. Mortimer, 1902. 1902 No. 66 – Medal and case: brown metal; approximately 4cm in diameter; front inscribed Southsea Photographic Society; back inscribed F.J. Mortimer, 1902. 1902 No. 67 – Medal and case: brown metal; approximately 4cm in diameter; front inscribed Southsea Photographic Society; back inscribed F.J. Mortimer, 1902. 1902 No. 68 – Medal: brown metal; approximately 4cm in diameter; front inscribed County Borough of Salford, Rudman Mayor; back inscribed Salford Royal Museum and Art Galleries, Exhibition of British Pictorial Photography, 1902. 1903 No. 69 – Medal and case: white metal; approximately 4cm x 6cm; front inscribed Southampton Camera Club, 1903; back inscribed Marine Class, F.J. Mortimer. 1903 No. 70 – Medal and case: brown metal; approximately 4cm x 6cm; front inscribed Southampton Camera Club, 1903; back inscribed In the Height of the Storm, F.J. Mortimer. 1903 No. 71 – Medal and case: gold (hallmarked); approximately 4cm x 6cm; front inscribed Southampton Camera Club, 1903; back inscribed Marine Class, F.J. Mortimer. 1903 No. 72 – Medal and case: silver (hallmarked); approximately 4.5cm in diameter; front inscribed Isle of Wight Photographic Society; the back inscribed Exhibition, 1903, Class B, F.J. Mortimer. 1903 No. 73 – Medal and case: brown metal; approximately 4.5cm in diameter; front inscribed Isle of Wight Photographic Society; the back inscribed Exhibition, 1903, Class C, F.J. Mortimer. 1903 No. 74 – Medal and case: white metal; approximately 4cm x 6cm; front inscribed Southsea Photographic Society, 1903; back inscribed F.J. Mortimer. 1903 No. 75 – Medal and case: brown metal; approximately 4cm x 6cm; front inscribed Southsea Photographic Society, 1903. 1903 No. 76 – Medal and case: white metal; approximately 4cm x 6cm; front inscribed Southsea Photographic Society, 1903; back inscribed F.J. Mortimer. 1903 No. 77 – Medal and case: brown metal; approximately 4cm x 6cm; front inscribed Southsea Photographic Society, 1903; back inscribed F.J. Mortimer. 1903 No. 78 – Medal and case: white metal; approximately 4cm x 6cm; front inscribed Hove Camera Club, 1903; back inscribed Lantern Slides Open, F.J. Mortimer. 1903 No. 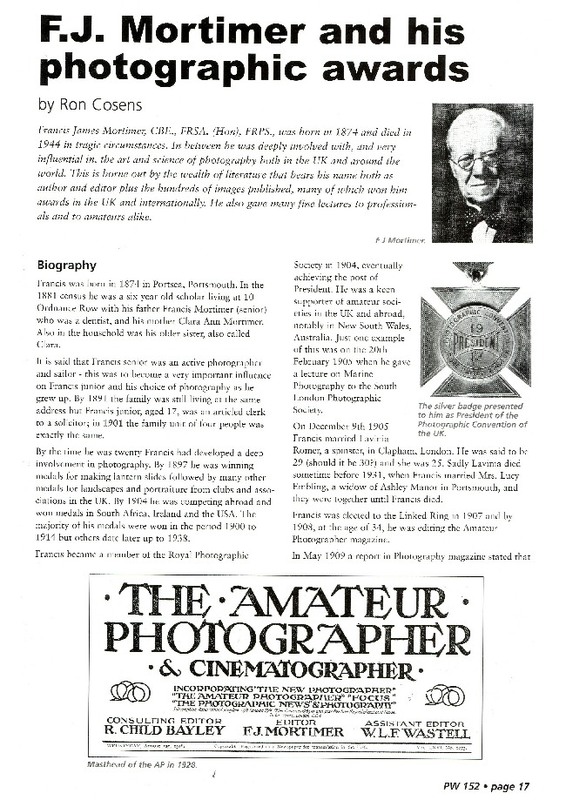 79 – Medal and case: white metal; approximately 4cm x 6cm; front inscribed Hove Camera Club, 1903; back inscribed Club Class Portraiture, F.J. Mortimer. 1903 No. 80 – Medal and case: brown metal; approximately 4cm x 6cm; front inscribed Hove Camera Club, 1903; back inscribed Lantern Slides Open, F.J. Mortimer. 1903 No. 81 – Medal and case: gold (hallmarked); approximately 3cm in diameter; front inscribed Presented by the “Amateur Photographer”; back inscribed “Amateur Photographer” Prize Medal, Annual Lantern Slides Competition, 1903, F.J. Mortimer. 1903 No. 82 – Medal and case: brown metal; approximately 5cm in diameter; front inscribed Presented by the “Amateur Photographer”; back inscribed “Amateur Photographer” Prize Medal, Surveyor & Record Competition, 1903, F.J. Mortimer. 1903 No. 83 – Medal and case: silver (hallmarked); approximately 4.5cm in diameter; front inscribed The Journal of the Amateur, the Profession & the Trade: Photography; the back inscribed Medal for Home Portraiture, Won by F.J. Mortimer, 1903. 1903 No. 84 – Medal and case: silver (hallmarked); approximately 4.5cm in diameter; front inscribed The Journal of the Amateur, the Profession & the Trade: Photography; the back inscribed Medal for Breaking Waves & Sea Studies, Won by F.J. Mortimer, 1903. 1903 No. 85 – Medal and case: gold (hallmarked); approximately 2.5cm in diameter; edge inscribed 3rd Andover Amateur Photographic Exhibition; back inscribed Awarded to F.J. Mortimer, Class A Portrait Study, August 3rd 1903. 1903 No. 86 – Medal and case: brown metal; approximately 4cm in diameter; front inscribed 3rd Andover Amateur Photographic Exhibition; back inscribed Awarded to F.J. Mortimer, Class B Seascape, August 3rd 1903. 1903 No. 87 – Medal and case: brown metal; approximately 4.5cm in diameter; front inscribed Ealing Photographic Society; back inscribed 1905, F.J. Mortimer, Seascape; case inscribed Ealing Photogr’c Soc: 1903. 1903 No. 88 – Medal and case: brown metal; approximately 4.5cm in diameter; front inscribed Ealing Photographic Society; back inscribed 1905, F.J. Mortimer, Lantern Slide; case inscribed Ealing Photogr’c Soc: 1903. 1903 No. 89 – Medal and case: silver (hallmarked); approximately 11cm x 6cm; inscribed Sheffield Photographic Society, F.J. Mortimer, 1903. 1903 No. 90 – Medal and case: silver (hallmarked); approximately 11cm x 6cm; inscribed Sheffield Photographic Society, F.J. Mortimer, 1903. 1903 No. 91 – Medal and case: brown metal; approximately 11cm x 6cm; inscribed Sheffield Photographic Society, F.J. Mortimer, 1903. 1903 No. 92 – Medal and case: white metal; approximately 5cm x 4cm; front inscribed Hackney Photographic Society; back inscribed Won by F.J. Mortimer, 1903. 1903 No. 93 – Medal and case: silver (hallmarked); approximately 4cm in diameter; front inscribed Plymouth, Devonport & Stonehouse Trades, Industrial & Photographic Exhibition, 1903; back inscribed Plymouth, 1903. 1903 No. 94 – Medal and case: silver (hallmarked); approximately 4cm in diameter; front inscribed Watford Camera Club, Oct 6th, 1903; back inscribed Awarded to F.J. Mortimer, Class A, Landscape, Open. 1903 No. 95 – Medal and case: brown metal; approximately 4cm in diameter; front inscribed Rotherham Photographic Society; back inscribed 1903 Exhibition, Second Award, Class C, F.J. Mortimer. 1903 No. 96 – Medal and case: silver (hallmarked); approximately 6cm x 3cm; front inscribed Edinburgh Industrial Exhibition; back inscribed Awarded to F. Mortimer for Photography, 1903. 1903 No. 97 – Medal and case: brown metal; approximately 5cm in diameter; front inscribed Edinburgh & Midlothian Industrial Exhibition; back inscribed Awarded to F. Mortimer for Photography, 1903. 1903 No. 98 – Medal and case: silver (hallmarked); approximately 4.5cm in diameter; back inscribed Frome 1903, Champion, F.J Mortimer. 1904 No. 99 – Medal and case: brown metal; approximately 6cm in diameter; front inscribed Glasgow East End Industrial Exhibition, 1903-1904, Awarded to F.J. Mortimer; back inscribed For the Royal Infirmary. 1904 No. 100 – Medal and case: yellow metal; approximately 4cm in diameter; back inscribed South London Photographic Society, Awarded to F.J. Mortimer for the Best Picture in the 1904 Exhibition. 1904 No. 101 – Medal and case: white metal; approximately 9.5cm x 5cm; front inscribed The South London Photographic Society; back inscribed 1904, Open Landscape Class, Awarded to F.J. Mortimer. 1904 No. 102 – Medal and case: brown metal; approximately 9.5cm x 5cm; front inscribed The South London Photographic Society; back inscribed 1904, Open Lantern Slides, Awarded to F.J. Mortimer. 1904 No. 103 – Medal and case: brown metal; approximately 9.5cm x 5cm; front inscribed The South London Photographic Society; back inscribed 1904, Open Portraiture Class, Awarded to F.J. Mortimer. 1904 No. 104 – Medal and case: silver (hallmarked); approximately 4.5cm in diameter; front inscribed Bolton Amateur Photographic Society; back inscribed Portraiture, F.J. Mortimer, 1904; case inscribed Bolton Amateur Photogr’c Soc’y. 1904 No. 105 – Medal and case: brown metal; approximately 4.5cm in diameter; front inscribed Bolton Amateur Photographic Society; back inscribed Landscape, F.J. Mortimer, 1904; case inscribed Bolton Amateur Photogr’c Soc’y. 1904 No. 106 – Medal and case: brown metal; approximately 4.5cm in diameter; front inscribed Bolton Amateur Photographic Society; back inscribed Lantern Slides, F.J. Mortimer, 1904; case inscribed Bolton Amateur Photogr’c Soc’y. 1904 No. 107 – Medal and case: silver (hallmarked); approximately 4.5cm in diameter; front inscribed Longton and District Photographic Society; back inscribed Awarded to F.J. Mortimer, 1st Prize for Seascape, 1904. 1904 No. 108 – Medal and case: brown metal; approximately 4.5cm in diameter; front inscribed Longton and District Photographic Society; back inscribed Awarded to F.J. Mortimer, 2nd Prize for Portraiture, 1904. 1904 No. 109 – Medal and case: brown metal; approximately 6cm x 9.5cm; front inscribed Croydon Camera Club; back inscribed 1904, F.J. Mortimer. 1904 No. 110 – Medal and case: brown metal; approximately 6cm x 9.5cm; front inscribed Croydon Camera Club; back inscribed 1904, F.J. Mortimer. 1904 No. 111 – Medal and case: brown metal; approximately 4.5cm in diameter; front inscribed North West London Photographic Society, 1904, F.J. Mortimer. 1904 No. 112 – Medal and case: brown metal; approximately 4cm x 2.5cm; front inscribed Chipplegate Photographic Society; back inscribed F.J. Mortimer, Class F, 1904. 1904 No. 113 – Medal and case: gold (hallmarked); approximately 4.5cm in diameter; front inscribed Cape Town Photographic Society; back inscribed Awarded to F.J. Mortimer, the “Cecil Rhodes Memorial” Medal for Most Artistic Picture, Exhibition 1904. 1904 No. 114 – Medal and case: brown metal; approximately 6.5cm in diameter; front inscribed Photographic Society of London, 1853; back inscribed Royal Photographic Society of Britain, H.R.H. The Prince Consort, Patron 1863-1861; case inscribed Royal Photographic Society, 1904. 1904 No. 115 – Medal and case: brown metal; 4cm x 6.5cm; front inscribed Devonport Camera Club; back inscribed May 1904, Seascape (Open), F.J. Mortimer. 1904 No. 116 – Medal and case: silver (hallmarked); approximately 4.5cm in diameter; front inscribed Plymouth Photographic Society – Founded 1894 – Slides, Wave Studies, F.J. Mortimer, 1904; case inscribed Plymouth Photographic Society, 1904. 1904 No. 117 – Medal and case: silver (hallmarked); approximately 4.5cm in diameter; front inscribed Chiswick Camera Club – Founded 1896 – Awarded to F.J. Mortimer, Class A, 1904; case inscribed Chiswick Camera Club, 1904. 1904 No. 118 – Plaque mounted on blue felt stand; brown metal; (with stand) approximately 10cm x 6cm; inscribed Awarded to F.J. Mortimer, Nottingham, 1904. 1904 No. 119 – Plaque and case; brown metal; approximately 22cm x 12.5cm; front inscribed Affiliation of Photographic Societies; back inscribed F.J. Mortimer 1904. 1904 No. 120 – Plaque and stand; silver (hallmarked); approximately 11cm x 15cm; inscribed Photographic Society of Ireland, 1904, Awarded to E.J. Mortimer, Open Class. 1904 No. 121 – Medal and case: brown metal; approximately 6.5cm x 6.5cm; front inscribed Universal Exposition, Saint Louis, United States of America, MCMIV; back inscribed Silver Medal, Louisiana Purchase Exposition; case inscribed Universal Exposition, 1904, Saint Louis. 1905 No. 122 – Medal and case: brown metal; approximately 5cm x 7cm; back inscribed C’est L’angelus Qui Tinte et Rappelle en Tout Lieu, Que Le Matin Des Jours et Le Soir Sont a Dieu; case inscribed Hove Camera Club, Exhibition 1905, Open Class, F.J. Mortimer F.R.P.S. 1905 No. 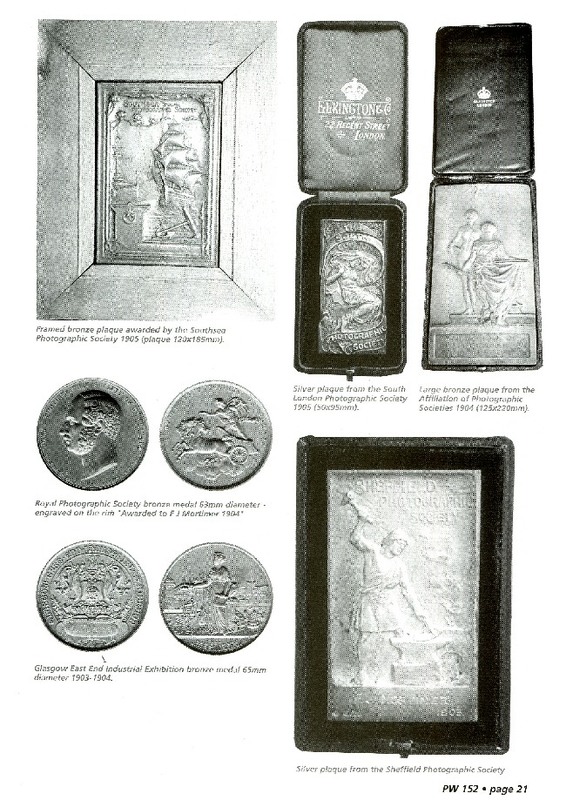 123 – Medal and case: brown metal; approximately 6.5cm x 3.5cm; front inscribed Association Belge de Photographie; back inscribed Vie Salon Liege, 1905, Concours de Diapositives, 1er Prix, Mortimer. 1905 No. 124 – Medal and case: yellow metal; approximately 3cm in diameter; front inscribed Esposizione Internazionale di Fotografia, Genova, 1905. 1905 No. 125 – Medal: white metal; approximately 4.5cm x 6cm; front inscribed Esposizione Internazionale di Fotografia, Genova, 1905. 1905 No. 126 – Plaque in wooden frame: brown metal; (with frame) approximately 22.5cm x 16cm; inscribed 1905, Southampton Camera Club, F.J. Mortimer. 1905 No. 127 – Plaque mounted on wooden stand: brown metal; (with stand) approximately 15.5cm x 18.5cm; inscribed Cambridge & District Photographic Club, 1905. 1905 No. 128 – Plaque in wooden frame: brown metal; (with frame) approximately 30cm x 24cm; inscribed Southsea Photographic Society, 1905, F.J. Mortimer. 1907 No. 129 – Plaque mounted on wooden stand: silver (hallmarked); (with stand) approximately 14cm x 10.5cm; inscribed West of England Exhibition, Plymouth, 1907. 1909 No. 130 – Medal: brown metal; approximately 7cm x 4cm; front inscribed Internationale Photographische Ausstellung, Dresdon, 1909. 1910 No. 131 – Medal and case: brown metal; approximately 4.5cm in diameter; front inscribed 1910, Nemzetkozi Fenykepkiallitas Budapeston, M.A.F.O.S. 1910 No. 132 – Medal and case: brown metal; approximately 4.5cm in diameter; front inscribed 1910, Nemzetkozi Fenykepkiallitas Budapeston, M.A.F.O.S. 1913 No. 133 – Medal and case: white metal; approximately 4.5cm in diameter; front inscribed South Suburban Photographic Society; back inscribed Presented to F.J. Mortimer, Past President, 1913. 1913 No. 134 – Medal and case: silver (hallmarked); approximately 4.5cm x 4cm; front inscribed Photographic Convention of the United Kingdom, President, 1913. 1914 No. 135 – Plaque: brown metal; approximately 10cm x 6.5cm; front inscribed Wales & Mon Photographic Federation, Heb-Wawl, Heb-Waith; back inscribed 1914. 1923 No. 136 – Medal: white metal; approximately 4cm in diameter; front inscribed Zarnal Fotografia; back inscribed Exposicion Internacional, Medalla de Cooperacion Madrid, 1923. 1928 No. 137 – Medal: brown metal; approximately 4cm in diameter; front inscribed Zarnal Fotografia; back inscribed Real Sociedad Fotografic, VII Salon Internacional Madrid, 1928. 1929 No. 138 – Medal and case: Gold (hallmarked); approximately 6.5cm x 4.5cm; front inscribed Internationalla Fotografi, Urstallningen 1, Goteborg, 1929. 1930 No. 139 – Medal and case: brown metal; approximately 6.5cm x 4.5cm; front inscribed To Commemorate the Twenty First Exhibition of the London Salon of Photography, 1930. 1932 No. 140 – Plaque: gold (hallmarked); approximately 12cm x 8cm; inscribed Awarded by the Johannesburg Photographic Society to F.J. Mortimer, Winner, First S.A. Salon, Sept 1932. 1938 No. 141 – Medal: brown metal; approximately 5.5cm x 3cm; front inscribed Focus; back inscribed Focus Foto Salon, 1938, Wilhelmina, 1898 – 1938, F.J. Mortimer. 1910 No. 170 – Goblet: white metal; approximately 15cm tall; inscribed AZ 1910 Evi Budapesti, Nemzetkozi Fenykep Kiallitas. 1902 No. 172 – Plaque: brown metal; approximately 10cm x 24cm; inscribed The Tenth Exhibition of the Photographic Salon, Promoted by the Linked Ring, 1902.
no date No. 182 – Printing block featuring horse and chariot; approximately 5.5cm x 8.5cm.